I love giving out recommendations. It is a rare occasion when I do because people know that I will give them a very long list. Here is a basic book recommendations, I recommend to anyone. Whether you love reading or not. Enjoy! Kristian’s War by Peter Wisan A retelling of Pilgrim’s Progress. So if you love marines and army based stories, this is the book for you. The Door by Lorilyn Roberts. A retelling of Alice and Wonderland. I could continue doing this forever. 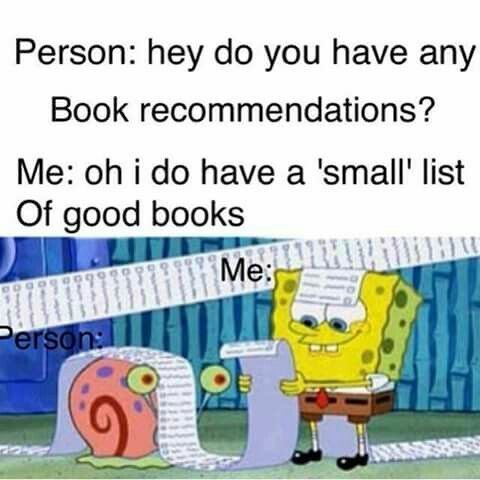 But to save us the trouble I won’t list anymore books. Its for the best. Merry Christmas!